French artist Paulo Grangeon, "The Father of 1600 Pandas" with 1600 Pandas arriving in Malaysia yesterday, December 21 2014. I has been told that Malaysia is their third stop of the 1600 Pandas World Tour in the Asian Region, after Taiwan and Hong Kong. "Initiating the Culture of Creative Conservation", is the main theme of the appearance of 1600 Pandas. 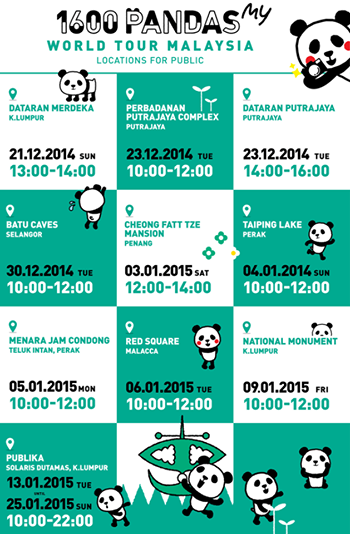 The adorable pandas will begin their nationwide journey to more than 15 iconic landmarks in Malaysia from December 21 2014 till January 25, 2015. Here is the date for the 1600 Pandas World Tour In Malaysia. In addition, 1600 Pandas World Tour which started in 2008 as a collaboration between WWF and Paulo Grangeon, has since appeared in more than 100 exhibitions across various countries such as France, Holland (the Netherlands), Italy, Taiwan, Switzerland and also Hong Kong. Not only that, the grand finale of the 1600 Pandas World Tour in Malaysia will take place at Publika from 13 till 25 January 2015 and everyone will have the opportunity to check out the pandas at the closer proximity. The sponsor- MBI International, XOX Mobile and also Publika for this awesome event. The volunteer with the one of the 1600 Pandas! Not only that, 1600 Pandas will be available for online adoption, where we can adopt the papier mache pandas at RM150 each for one of the adorable pandas. The Registration of Interest (ROI) will start on 12 January 2015. Are the pandas look adorable? I would like to thanks all the volunteers, sponsors such as MBI International, which is the premier sponsor of this campaign, as well as Publika, XOX mobile and also PKT Logistics Hub. Furthermore, I want to this opportunity to thanks everyone including live steam media, blogger and even public that supporting this event. I'm going to adopt this adorable pandas soon! How about you? I been told that in this world, there only left 1600 pandas left in the world. It is not even half of the population of in a state of Malaysia. We should unite together to handle this problem before all the pandas is really distinct. Lets all of us support this events to help all the innocent pandas. I am of the the media as blogger for this awesome event!